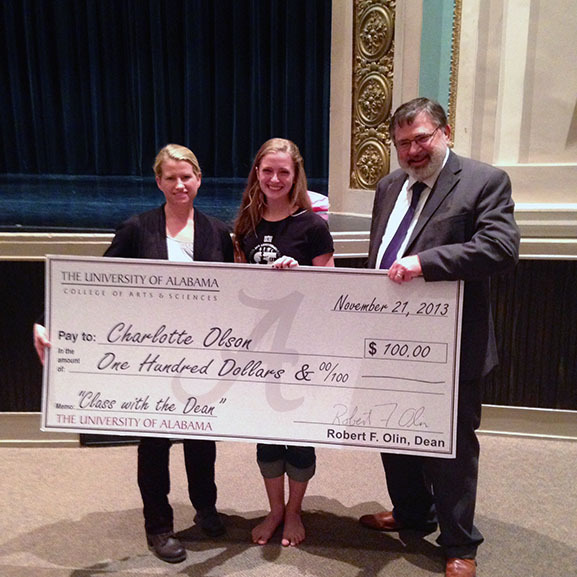 Charlotte Olsen, center, was this year’s winner of the “Class with the Dean” social media contest. Dean Bob Olin, right, accompanied her to her choreography class taught by Associate Professor Sarah Barry, left. The class was one of three involved in the Collaborama! interdisciplinary performance and exhibit of art, dance, and writing. Charlotte Olson, a junior dance major from Jasper, Ind., wrote the winning entry in this fall’s “Class with the Dean” social media contest, which asked students to tell the dean about their favorite class in the College of Arts and Sciences. Dean Bob Olin accompanied Olson to Associate Professor Sarah Barry’s undergraduate choreography class in the Department of Theatre and Dance, where he witnessed final preparations for Collaborama!, an interdisciplinary performance and showcase. The Dec. 5 performance featured collaborative work from student writers, dancers, and artists from across the College. Collaborama! showcased the semester-long collaborations of creative writing, choreography and printmaking classes taught by Professor of English Robin Behn, Associate Professor of Dance Sarah Barry, and Associate Professor of Art Sarah Marshall, respectively. Some of the collaborations were writers working with other writers, choreographers working with other dancers, and artists working with other artists. However, since the classes were scheduled to meet at the same time, cross-disciplinary collaborations also blossomed. The event featured a gallery space in the foyer of Morgan Hall’s auditorium that showcased original prints, and printer-writer collaborations such as illustrated storybooks and sequences of captions with images. Inside the auditorium, attendees were treated to original dances set to music and to texts provided by the writers and the classes’ four final projects, each of which involved students from all three classes. Art by Lonica Huff in ART 325 Monotype class. Collaborama, a performance showcasing the semester-long collaborations of creative writing, choreography, and printmaking classes, took place in Morgan Auditorium Dec. 5. Art work on display in the lobby of Morgan Hall as part of Collaborama. Victoria Beale, Julia Fagoh, Brie Timmons and Elizabeth Williams perform “Revel” at Collaborama. Erika Davis and Michael Clark perform “What Was,” at Collaborama. Creative writing students Connor O’Neill, Ryan Bollenbach, and Nicole Rivas perform “Are you there, God? It’s me, the old swimming suit” at Collaborama. Charlotte Olson, Brianna Long, Ashley Smith, and Caroline Spillane perform “Winter Wandering” at Collaborama. Olsen was the winner of the “Class with the Dean” social media contest that asked students to name their favorite class. Dean Bob Olin came to Olsen’s class and presented her with a $100 scholarship for her winning entry.